New clippings document the Crockett family bringing baseball back to Charlotte. "There were very few stadiums in the world that could compare with the very colorful and beautiful wooden ballpark that went by two different names… Clark Griffith Park and from 1971 onward, Jim Crockett Park. The beautiful wooden grandstand interwoven with steel beams was a marvel when it was completed and as memorable as it was… would also become its downfall. The history books are filled with sad stories of these grand wooden ballparks meeting their hellfire endings at the hands of a tossed match, a flicked cigarette or even by some very rotten children. This ballpark's finality would come via the latter." 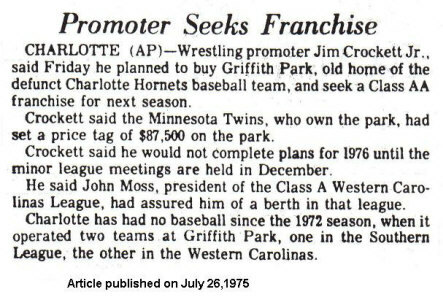 Originally called Clark Griffith Park, the ballpark was renamed Jim Crockett Memorial Park a year after the Crockett family purchased the minor league Orioles baseball franchise and brought the team from Asheville NC to Charlotte for the 1976 season. The team was the AA farm affiliate of the Baltimore Orioles, and played in Charlotte until 1988. The O's won a couple of Southern League titles including in a 1980 championship for a team led by Cal Ripken, Jr. Charlotte had been without baseball since 1972. Frances Crockett oversaw baseball operations for the Crockett family business and was the president of the Charlotte Orioles, and at one time was the commissioner of the Southern League. The ballpark was built in 1940 and when the Orioles began play there, it held over 5,000 fans. 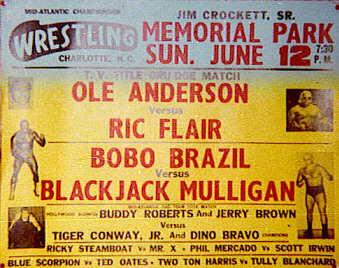 Mid-Atlantic Wrestling cards were held there occasionally. It was destroyed by fire on March 16, 1985. 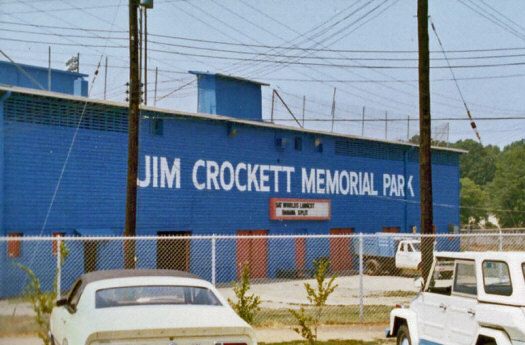 The ballpark was renamed from Clark Griffith Park to Jim Crockett Memorial Park in June of 1977. 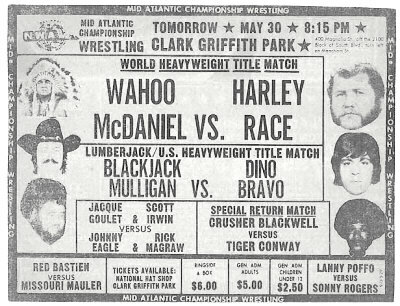 The clippings below for two outstanding Mid-Atlantic Wrestling events on 5/30/77 and 6/12/77 reflect the name change. "If I’m not mistaken, Crockett Park in Charlotte was, for a time, the only wood-framed ballpark in America. It was certainly the only ballpark in America named for a wrestling promoter. That was Big Jim Crockett...." - Joe Posnanski. Read more. A luxury residential development called Olmstead Park now occupies the 12.5 acre site that was Crockett Park. 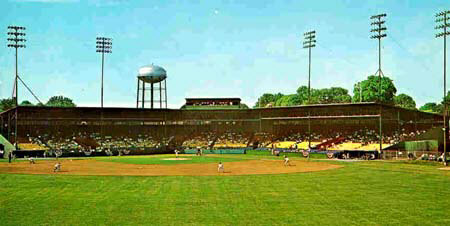 Houses now sit where the bleachers and grandstands once stood, and upscale apartments now occupy what had been the infield for the Charlotte O's. Crockett Park file photo (black & white photo above) from the Charlotte Observer, submitted by George South. Newspaper clippings and poster image for 5/30/77 and 6/12/77 Mid-Atlantic shows from the collection of Greg Price. Olmstead Park photo (Crockett Park as it looks today) from Clay Reality Advisors. 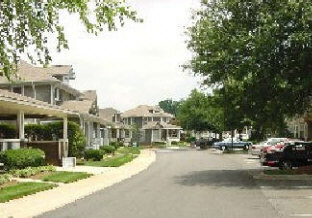 Description of modern day Dilworth Neighborhood from Charlotte Real Estate News. Thanks also to Greg Price for his assistance with information for this feature on Crockett Park. 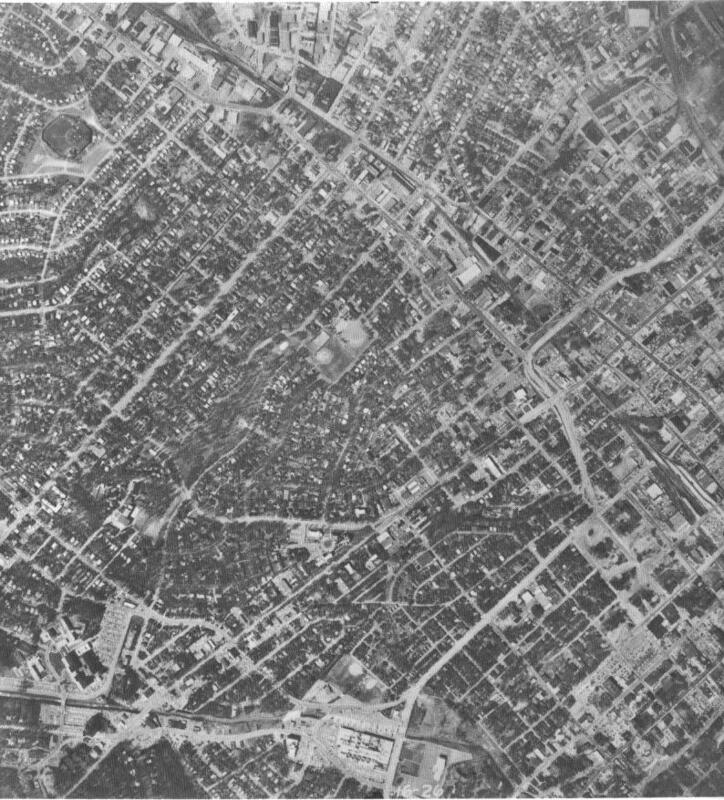 Arial photo from 1965, Crockett Park can be seen in the center of the photo, South Blvd to it's left. 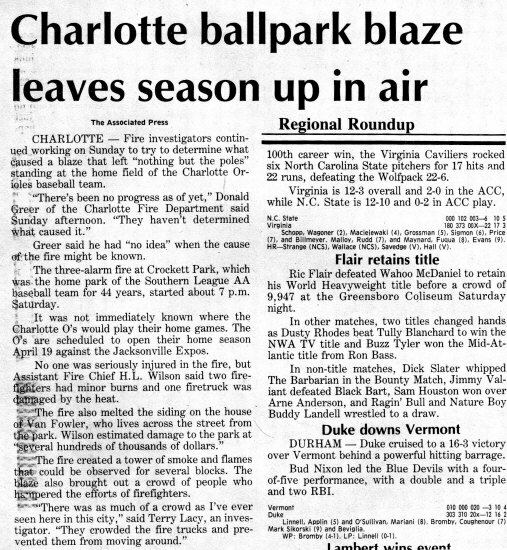 The following clippings chronicle the life of Crockett Park when the Crockett's became involved in baseball, including decision by the Crocketts to bring a minor league baseball team back to Charlotte in 1975, the negotiations to purchase Griffin Park, the O's first game there in April of 1976, and destruction of the park by fire in 1985. Thanks to Carroll hall for his assistance with this feature. If I’m not mistaken, Crockett Park in Charlotte was, for a time, the only wood-framed ballpark in America. It was certainly the only ballpark in America named for a wrestling promoter. That was Big Jim Crockett. The park had originally been named for Clark Griffith — they called him the Old Fox in his playing days — and for many years Charlotte had been a Washington Senators and Minnesota Twins weigh station. Harmon Killebrew played in Charlotte. Tony Oliva. Graig Nettles. Early Wynn. But the town lost interest, and the team moved away. The Crocketts — famed throughout the South for Jim Crockett Promotions, which would introduce to the world Ric Flair and Blackjack Mulligan and Dusty Rhodes and many other wrestlers of various nationalities — brought a Baltimore Orioles minor league baseball team back to town in the early 1970s. Big Jim’s youngest daughter, Frances Crockett, ran the team. The old wrestler Klondike Bill was the groundskeeper. Frances came up with a bunch of wrestling-type promotions, the most memorable for a 19-year-old boy being the Pepper girls, a collection of pretty young women who would wander around the stadium in halter tops and shorts and, well, um, wander around the stadium in halter tops and shorts. I’m not sure if Frances was the first one to come up with this concept, but I do know that she had the best answer to anyone who was offended. She pointed out that her daughter, Lisa, was a Pepper Girl. Anyway: Crockett Park was an amazing place. It felt old and dingy, no question, but when you wandered in there, you could not help but feel like you were wandering into another time. A wood ballpark smells a little bit different. It feels a little bit different. You half expected men in fedoras to walk in (they never did, or at least I never saw them, but I might have been looking at the Pepper Girls). Cal Ripken Jr. played in Charlotte in 1980, Storm Davis in 1981, but like all kids in minor league towns, I remember the local legends, like Drungo Hazewood, who hit 68 home runs over his Charlotte career, but one year struck out 177 times. One other thing about wooden ballparks — they burn. In 1985, the ballpark burned to the ground. The rumor always was that some kids burned it down, perhaps with intention, perhaps by accident, but I don’t think anyone was ever arrested, and anyway I heard that rumor from the same people who said that Mikey’s stomach exploded while drinking Coke and eating Pop Rocks. 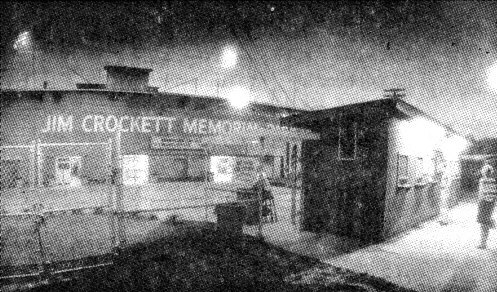 In any case, the Crocketts were industrious souls, and so they threw together a makeshift ballpark that included rickety metal stands and trailers that served as clubhouses.